Built in the early 15th century the castle was owned by the famous Keith family. It was well known back then, that the Keiths and the Gunns were in a feud for years, and after numerous murders and conflicts between them, a legend relates the tale of a young woman, Helen Gunn, who was abducted by a member of the Keith family for her unparalleled beauty. The unfortunate woman flung herself from the highest tower of the castle, to escape her abductor. Rumour has it that her ghost still haunts the tower’s rooms. Since then, the castle has been significantly extended in the 19th century by the architect David Bryce, and extensively refurbished in the 21st century. 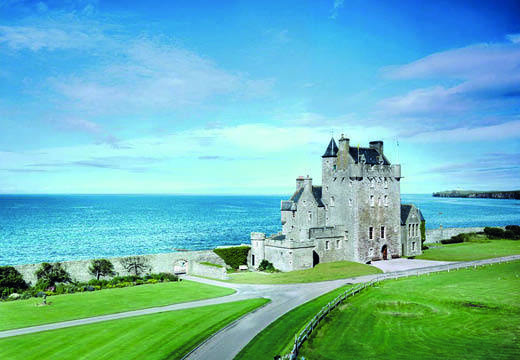 Nowadays, the Ackergill Tower is one of the most luxurious hotels in the world, with several areas of accommodation such as the main tower, the beach house and the sunshine and seashore cottage. All the rooms are tastefully decorated with antique furniture, luxurious soft furnishings and sumptuous fabrics. In addition to its history and uniqueness, this property is easily accessible, set in 30 acres of its own grounds and gardens, including a Victorian walled garden and a breath-taking view. There is a flexibility of use, as it can operate as either a hotel or an exclusive use venue, such as weddings or parties.